Following last week’s report on two past administrations’ blacklisting of cultural figures, the Culture Ministry on Wednesday issued the Moon Jae-in administration’s first official apology over the matter. It also pledged to modify the current system to ensure that such blacklisting would not reoccur. 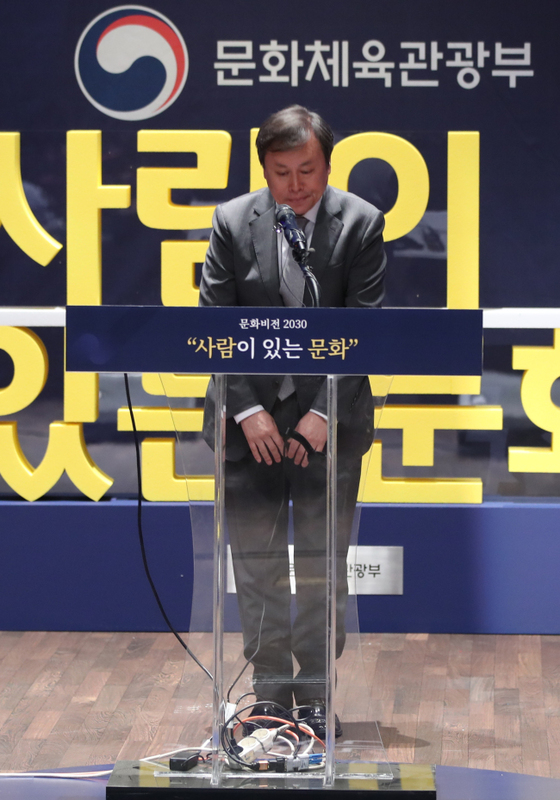 In a press conference announcing “Culture Vision 2030” -- the government’s plans for the culture sector through 2030 -- Minister of Culture, Sports and Tourism Do Jong-hwan officially apologized on behalf of the government. It came after a government-civilian committee’s report on its yearlong investigation, which was accompanied by its recommendation that the government establish an independent committee on subsidizing cultural figures. Do vowed to establish systems to ensure that the blacklisting of entertainers and artists would not occur again. It was revealed in last week’s report that 8,931 individuals and 342 groups in the culture and entertainment sector were unlawfully penalized -- monitored and/or excluded from government subsidies -- during the Lee Myung-bak and Park Geun-hye administrations. They were included on the list as they were deemed anti-government or pro-North Korea by the authorities. The scandal came to light in late 2016 and played a part in the downfall of Park, who was impeached over corruption. On the heels of former Culture Minister Cho Yoon-sun’s arrest, the ministry publicly apologized in January 2017. Wednesday’s apology was the first one since President Moon Jae-in was sworn in last year. The policy changes announced Wednesday include ensuring that Art Council Korea, the biggest government subsidy organization, is free from the ministry’s influence. Changes will be made to the law to make the group an independent entity by 2020, and the chief of the council will be elected by council members. The current law stipulates that the Culture Minister appoints the council head. Ensuring the independent operation of the council formed the backbone of the joint government-civilian committee’s recommendation. Guaranteeing the rights of artists is one of the nine key agenda items of Culture Vision 2030. Others include expanding individuals’ rights to enjoy culture; implementing a culture of gender equality; protecting cultural diversity; creating equal opportunities in the culture sector; fostering region-based cultural content; boosting support for research and education; expanding cultural cooperation abroad; and improving people’s lives through culture. These reflect the issues that have gripped the culture sector, such as the series of sexual scandals involving prominent cultural figures. Disgraced theater director Lee Youn-taek is currently being tried for abusing his position to sexually assault actresses. The ministry’s plan includes a regular probe into sexual violence or gender discrimination, and excluding perpetrators from receiving government aid. The newly announced road map for the culture sector includes a push for more cultural exchanges with North Korea, the possibility of which is buoyed by improving relations between the Koreas. A South Korean art troupe performed in Pyongyang last month, which was followed by North Korea leader Kim Jong-un’s first visit to South Korea for a summit with Moon. Culture Vision 2030 was established through eight months of discussions among 8,000 private sector experts.